What if this is where the story (Matthew 2:1-12) stopped? If this is the end of the story, is it enough? Three magi have walked into the scene. They bring gifts. They represent various ages and various races. They are pilgrims. Melchior is a knight in armor, so perhaps we are supposed to see him as a crusader. 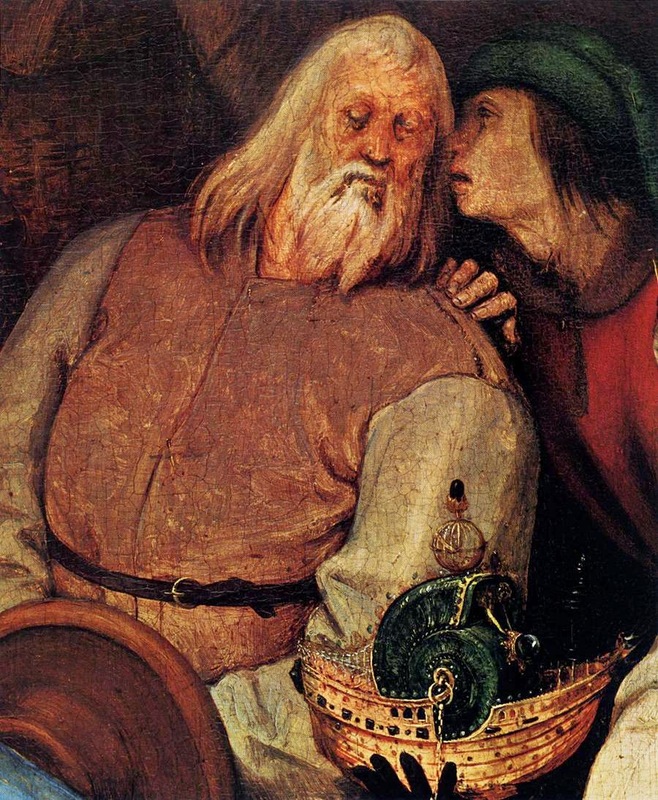 Balthasar at the right wears a robe decorated with a ship, an indication of his journey. We might see Gaspar's white hair and beard as an indication of his wisdom. The three have followed the star, here carried in the hand of an angel. They stand before the Christ child, Mary and Joseph. The baby shrinks away from the three toward his mother. Do you think this is what they thought they would find at the end of their journey? Are they pleased with the wicker and thatch shelter? Are they disappointed with who and what they find? They have taken off their crowns, and Gaspar's is on the ground. What if the story ends here? Is it enough? Though they have found their way to the Holy Family, they have not yet bowed down and worshiped Christ. Not yet acknowledged this baby as the king they were seeking. Will they now? Will they ever? 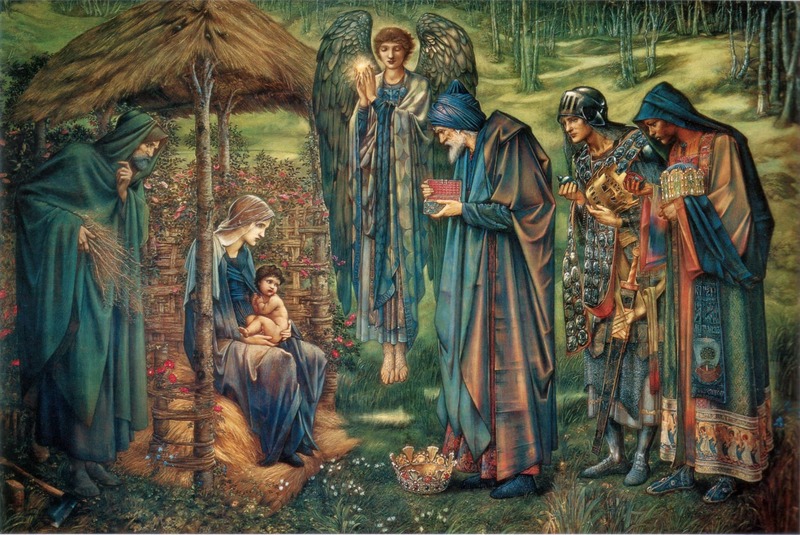 Burne-Jones has left them as eternal seekers. On the brink of redemption. It was a story in which the artist saw himself. 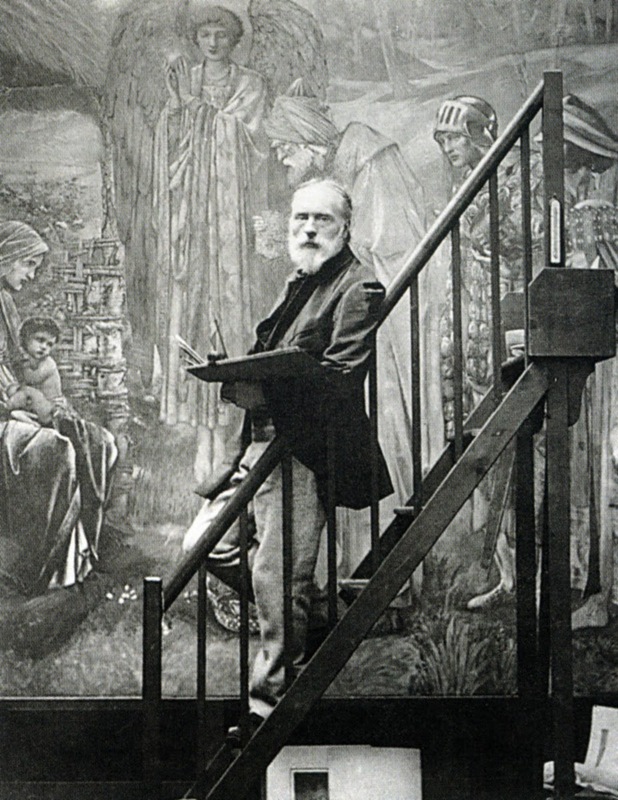 In a memoir by his wife, Burne-Jones is quoted as saying that the painting was physically exhausting: "...a tiring thing it is, physically, to do, up my steps and down, and from right to left. I have journeyed as many miles already as ever the kings travelled." (G. Burne-Jones, Memorials. 2:209) In the photo he stands in line with the three visitors. Are his brush and palette the gift he brings to the child? Perhaps this is the story of each of us. Making the journey as we seek God, and getting to the moment. The moment where we must decide about worshiping and presenting our gifts. Will they - and we - make the journey and arrive but never commit, kneel, acknowledge? For additional thoughts on Isaiah 60:1-6, click here. For additional thoughts on Matthew 2:1-12, click here and here. Who are these guys and what is the boat-like object at the bottom right? And what do they have to do with Epiphany? Click here for the Art&Faith Matters Facebook page to read more about the painting and the ship. Click on the Food&Faith Matters link below to find out about a Galette des Rois.